Everything You Need, Want, and Desire for Your Commercial Kitchen! Since Sid Singer founded the Automatic Ice Maker Company back in 1961, the Singer family has provided quality, hassle-free refrigerator, freezer, ice maker, and display solutions for restaurants, delis, stores, and warehouses across New Jersey, the tri-state area, and beyond. Through consistently maintaining an extensive inventory of reputable brands, a well-stocked selection of new and used equipment, first-class customer care, and guaranteed service, the Automatic Ice Maker Company has become New Jersey’s leader in commercial refrigeration equipment. NJ's LEADER in Ice Machines , Commercial Refrigeration, and Restaurant Equipment. Whether you need a replacement commercial ice machine or refrigerator in a hurry, or are looking to upgrade your commercial cooking equipment, turn to Automatic Ice Maker Co. for guaranteed service and competitive prices on top brands. NJ's Only Authorized Hoshizaki Distributor! A major problem for many restaurant owners, hospitality managers and other individuals in the food industry is finding a company that not only offers the commercial cooking equipment they need, but which also provides exceptional customer service and excellent product knowledge. Because we specialize in meeting the needs of high-volume caterers, we have a good understanding of the market and can usually come up with a cost-effective solution to your catering needs. Whether you’re just starting out in the restaurant business, or are looking at replacing your existing equipment with a better performing option, we can help. Competitive pricing, driver assisted deliveries, dependable parts availability, and, a staff of competent, friendly salespeople assisting you in any way they can. That’s what is included in our prices. We call it buying “Peace of Mind”. The Restaurant Equipment showroom is located in Middlesex, NJ and hosts a large selection of all the products that we distribute from commercial ice makers, commercial cooking equipment, bar equipment, bar equipment, reach-in refrigerators and freezers, glass door merchandisers, and deli display cases. Come see all of our equipment in person… It Makes a Difference!!! JWJ Restaurant Equipment outlet is your Restaurant Equipment and Ice Maker dealer in New Jersey. 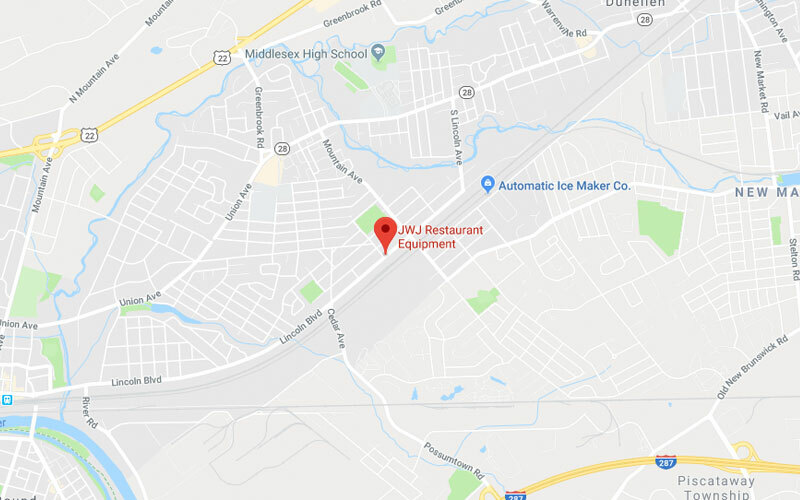 Auto Ice is proud to announce that we now supply Used Restaurant Equipment in NJ through JWJ Used Restaurant Equipment. Our NJ Used Restaurant Equipment is Bought and Sold in our corporate headquarters and also on display at our Restaurant Equipment Showroom in Middlesex, New Jersey. Upgraded with the new stainless steel interior, Hoshizaki offers you superior refrigeration for a better value. Our Commercial Series Refrigeration equipment gives you the durability of stainless steel while retaining the key features that put us ahead of the competition. t's the promise of reliability... and the peace of mind that comes with it. It's performing beyond expectations... with relentless durability and sustainability. It's knowing we've already thought about your future and can endure at the next level. It's tough in the kitchen... and gentle on the planet. It's in our DNA: Efficient, Reliable, Clean, Durable. Offering a variety of refreshing ice. We don't just make ice, we make the world's most perfect ice. Strength, Reliability, Durability. It's what Hoshizaki equipment brings to your commercial foodservice operation!